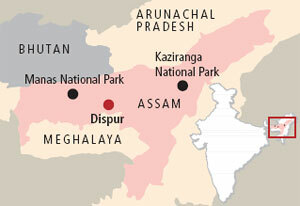 A decade ago, Manas National Park in Assam, a natural world heritage site (WHS), was reeling from political turmoil which damaged habitat and wildlife. In 1992, UNESCO declared the park a heritage site in danger; seven years after it was inscribed in the WHS list. The decline in violence following the 2003 agreement between the Indian government and Bodo leaders has benefited Manas. UNESCO has shown interest in removing it from the endangered list. 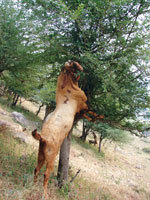 But lack of reliable scientific data on the major wildlife populations has proved to be a hurdle. In the absence of such data, it was difficult to prepare heritage site management plan. Our study conducted between 2006 and 2008 provided baseline information about the major wildlife populations. Using scientific techniques of population estimation, we found the presence of tigers in low abundance. But interestingly there was a marked improvement in signs that indicated tigers’ presence, like pugmarks. In the absence of previous estimates of the carnivore and prey base, we tried comparing tiger and prey densities of Manas with that of other tiger reserves. After analysis, we found that while Manas still has the lowest abundance of both tiger and prey compared to other four tiger reserves, it has a fairly good prey population that can potentially sustain more tigers. The study was carried out in one range of the National Park; the park has three ranges. Several organisations including the World Wide Fund for Nature (WWFIndia program), Aaranyak and ATREE/UNESCO are collaborating to provide technical support to government efforts at estimating wildlife population in Manas. 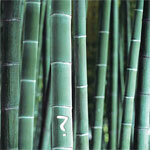 From the taxonomic point of view, bamboo undoubtedly belongs to the grass family Poaceae. But due to varied utility it is also widely acclaimed as poor man’s timber (‘Is bamboo a tree or a grass?’, December 1-15, 2010). Besides industrial demands, bamboo also meets the needs of communities in tribal belts. In southern Rajasthan, bamboo was chosen the principal species for rehabilitating degraded forestland. Forest produce is being managed by joint forest management committees (JFMCs), comprising forest officials and community representatives, from the early 1990s. The JFMCs prepare forest management plans. Bamboo is being harvested since 2002 and net revenue is shared equally between the government and community. In this process JFMCs are earning a sizeable revenue. This revenue is accumulated in the form of funds to be used for the development of villages. For instance, in Dhar village, district Udaipur, some of the funds have been used to electrify houses and other community- owned premises like school with solar panels. Since childhood, I have been taught that bamboo is the highest growing grass. It can be grown on marginal land generating additional revenue to farmers. Bamboo can be cut from third year onwards and can give consistent annual income for at least 25 years. 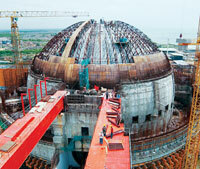 Nuclear power technology is a means to plunder developing countries (‘Nuclear chimera’, August 1-15, 2010). Power from the sun and wind is much cheaper. Nuclear power plants are not essential for public welfare. Plans to build them must be scrapped immediately. Primary electricity requirement of people for agriculture and manufacturing textile clothes, cement and footwear, can be fulfilled by setting up plants of 10 KW capacity that harness solar, wind or biomass energy. The article (‘Profit and loss’, November 16-30, 2010) has brought into focus the agony of death by debt. When moneylenders were exploiting the poor with high interest rates, government intervened by creating a self-help group model. When there was short supply of credit, micro-finance institutions came into play. But the two turned out to be worse than moneylenders. By charging high interest rates, they brought “death by default”. 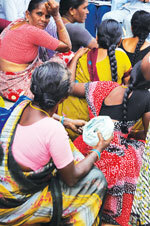 Fifty four suicides shook Andhra Pradesh. The state introduced an ordinance bringing some regulation, yet there is no cap on interest rates. The Tamil Nadu model of promoting selfhelp groups, preparing them to use the credit in a productive way and linking it with a saving culture appears to be good. It could also prove to be a good vote bank. Why can’t the government make use of this opportunity? People get lured by the so-called easy loans given by micro-finance companies which they use for non-productive activities. Consequently, they default. After nationalisation, banks became approachable. But they could not reach the farm labourers and landless workers. Banks are reluctant to finance this section for want of collateral support. This void was to be filled by self-help groups and micro-finance institutions, but they charged high interest rates and indulged in unethical practices like forcible collection of loan instalments. Economic progress of the rural poor and the landless remains stalled. But there is a way out. Self-help groups and non-profits should be mandated to create jobs for the poor instead of financing them. After learning that micro-finance institutions are growing at 80 per cent using borrowers’ lives as collateral I’m wondering how dehumanising greed can be. Who says vultures are on the verge of extinction when there are so many vultures in human form? Article ‘The scientist as a babu’ (November 1- 15, 2010) raises a question: is there a crisis of morality in the science establishment? But why only the science establishment? What about the 2G spectrum, and the Commonwealth Games? Richard Jefferson’s insight discussed in ‘The scientist as a babu’ is not surprising. Many scientists in Indian institutes have been echoing his view, only to be drowned by the “I know better” attitude of people in higher positions. 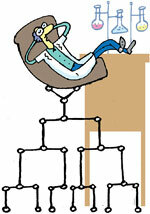 Science will not improve till we streamline our universities where rigid hierarchy and bureaucracy rule the roost. I see no solution to this problem except that time will level the playing field. ‘The goat gamble’ (December 1-15, 2010) highlights the socio-economic context, increasing dependence of the rural poor on the goat economy, the rising demand for goat meat and shrinkage of grazing land. Easing the feed constraint for goat comes out as critical for protecting income of the poor as well as the environment. As rightly pointed out in the write-up, a policy and coordination among relevant ministries is the need of the hour. Instead of wondering why no one is debating where goats will graze, we need to ask: why no one raises a voice against the killing of goats? Why the civilised man thinks only of himself? Why are goats considered an economic commodity? Why do some scientists want to increase the fertility rate of goats? Obviously, so that they can be slaughtered. But is it human? The counter argument could be since fertility rate is high in goats they ought to be slaughtered. This is absurd. Nothing shall happen to the earth if goats graze, but much will if man continues to plunder nature’s wealth and resources. It is good to see the government working on the cleaning of Buddha Nallah. It will pave the way for a better environment (‘Gutter will sparkle’, December 1-15, 2010). A good effort indeed. Such actions by authorities inspire people to keep their surroundings clean. Other states should learn from Ludhiana so that India becomes a greener country.